Goodbody, which is part of the FEXCO Group, is Ireland’s longest established stockbroking firm with roots dating back to 1874. FEXCO is a multinational finance and business solutions provider, with operations in 28 countries worldwide. Founded and headquartered in Ireland in 1981, FEXCO employs more than 2,000 people across Europe, the Middle East, Asia, North America, Latin America and Australasia. With over €9 billion in assets under management today, Goodbody Wealth Management has been delivering services that have helped to grow, protect and manage wealth for our clients for over 140 years. From investment management to estate planning, their services cater to all levels of risk appetite. They start with getting an in-depth understanding of every client’s specific needs and objectives in order to tailor a wealth management approach that considers all of their goals. 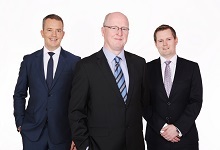 Goodbody Corporate Finance is one of Ireland’s leading corporate finance advisers. They work with Ireland’s leading companies and entrepreneurs to access international and domestic capital and execute strategic transactions. Their clients include major public companies, semi-state and Government entities, as well as some of Ireland’s leading private growth companies. They also advise financial and strategic investors from all over the world. They provide dedicated, senior level attention to help their clients achieve their objectives. Their team brings a wealth of international and domestic advisory and execution experience, as well as specialist sectoral expertise to provide independent and relevant advice to our clients. They have a dedicated senior team of 16 people with a wealth of international and domestic transaction experience and specialist expertise. Building on the reputation of their quality research on Irish equities and given the industry leadership positions of some Irish companies in certain sectors, Goodbody has in recent years extended its high quality research coverage into five key sectors and now covers over 60 Irish and international companies. Drawing on this core competence of fundamental research and sector expertise, the Goodbody institutional equity team offers research-driven investment ideas and a full execution service to over 300 institutional clients based across the UK, Europe and North America via a distribution network that rivals their international peers. Serving both long only and hedge fund clients, they believe in delivering value-added, innovative, timely and reliable advice to their clients which has helped forge strong relationships and partnerships with a broad range of international institutional investors. Their service is supported by strong order management and trading services, resulting in the execution of client orders efficiently and competitively. In fixed-income we have built a team of three salespeople with experience in sovereign debt, bank bonds and structured credit. Baker Tilly is part of one of the world’s leading networks of independently owned and managed accountancy and business advisory firms united by a commitment to provide excellent client service. As part of the leading Baker Tilly International network, they offer access to an even wider expert team – designed to help their client partners grow and prosper – locally, nationally and internationally. Baker Tilly is a multi-disciplinary firm with a singular focus on entrepreneurial, owner-managed and family owned businesses. With a high level of knowledge and technical expertise and by working directly with indigenous businesses, they have developed a unique insight into what makes businesses successful. The firm provides a broad range of services including audit, tax, corporate recovery, company secretarial and strategic corporate advice. Baker Tilly is the Irish representative of Baker Tilly International, a global association of independent accountancy firms. The firm was founded on Grafton Street in 1922 and has been advising businesses since the foundation of the State. Today, with offices in Dublin, Enniscorthy and Cork, they are one of Ireland’s fastest growing accounting, audit, tax and advisory firms. Baker Tilly’s expert Corporate Finance team offers a wide range of corporate finance services. Working predominantly for entrepreneurs who seek to grow their business, they offer strong commercial advice based on significant experience and the capability to help their clients deliver success. Baker Tilly is registered to carry on audit work in Ireland by Chartered Accountants Ireland and in the UK by the Institute of Chartered Accountants England & Wales.